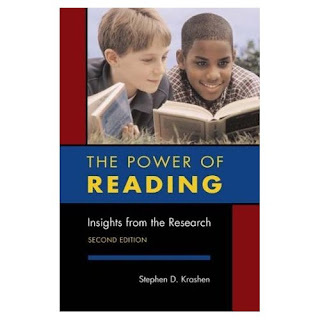 I had the opportunity yesterday to hear Stephen Krashen, author of The Power of Reading: Insights from the Research, speak about the importance of Free Voluntary Reading in creating proficient readers and writers. FVP is essentially reading whatever you want, for the pure pleasure of it - what we book addicts take for granted but what sounds absolutely alien to too many children out there. Krashen maintained that it isn't simple illiteracy that is the problem - he says most schools do an adequate job of teaching American children basic reading skills - but rather that more and more jobs are requiring higher reading skills than ever before, and many Americans are simply not up to the task. He cited several studies that show that it is poverty that is the highest indicator of poor reading skills - and a big reason for that appears to be a lack of access to books. Not only do poor households have overwhelmingly few books on their own shelves, but there are few bookstores or other sources of books in those neighborhoods. School libraries in poor neighborhoods are often rotten, as well - particularly here in California. Krashen also implied that public libraries in poor areas are worse than in wealthy areas. That is probably true in many communities, but at the Los Angeles Public Library, we do an excellent job of ensuring equity in ALL our 71 branches, from Brentwood to Watts. From book budgets to staffing to special programs, all our branches are on the same footing - while busy branches might get more staffing and/or material funds than slow branches, all receive the same minimum level of funding, and in many cases branches in poor areas receive extra funds. That quibble aside, Krashen's talk underscored what we all fervently believe - that without the skills that are obtained by reading for pleasure, children will be hard-pressed to do well in school or on the job. And he mentioned something that backs up my belief that we must keep trying to put books in the hands of reluctant readers, even when it seems futile - when kids are asked if there was one book or reading experience that interested them in reading, they not only say yes, but can often name the book! Jim Trelease calls these books "home run books" and it's our duty as children's librarians to keep finding the right home run book for the right child. The event at which Stephen Krashen's talk took place was the 20th Anniversary of LAPL's Grandparents and Books (GAB) program, an amazingly successful volunteer program in which volunteers read to children one-on-one - for fun, of course, not as a tutoring program - in our branches and at Central Library. We train the volunteers in good reading-aloud techniques, tell them about new trends in literacy and children's literature, show them oodles of great books, and then they go off to their neighborhood branch, all inspired and ready to read to kids - some of whom would never be read to otherwise. It's been going on for 20 years, and may it last at least 20 more! Below is a display made by my colleague Maureen Wade, who has administered the GAB program since its beginning. You are so lucky. I would love to see Stephen Krashen speak! I'd love to know more about your two day training. I have a lot of volunteers who want to read to children and this program sounds perfect! We require 2 3-hour training sessions for our reading volunteers, during which we model read-aloud techniques (and have the volunteers practice in groups), tell them how to choose different books for different age groups, share techniques for attracting kids' attention (reading volunteers are competing with computers and more), and most of all, booktalk and read oodles of great read-alouds. And very important - we fingerprint all these volunteers, as they are working with kids. Haven't read a single one - yet! Freedom to explore the "wilderness of childhood"